WindRose Morris-Keating has recently returned from living nearly 20 years in the British Isles. Her early training came through a deep immersion in the arts, in particular: theatre, mask-work & puppetry. These are the basic elements of ritual the world over. She came to healing as a result of her own struggle with scoliosis. Her healing work is strongly influenced by the Celtic traditions and philosophies, as well as the indigenous traditions of healing from the Anahuac peoples of Mexico. Along with this training she also studied Celtic Shamanism with Geo Cameron, a Scottish healer; been part of a European Shamanic Theatre group; and completed a 5 year apprenticeship with Miahuatzin (Eloxochitl) Ivonne Buendia Sanchez, a traditional Healer from Mexico, in 2009. She is a certified teacher of Mexhika Pactli/Curanderismo. Dylan Keating, a native of Ireland, has been apprenticed to the plant realms for a very long time. He studied organic horticulture and the first organic college in Ireland. Through needing to heal his own illnesses he embarked on a journey of discovery and re-connection with the natural world. His journey with Lyme Disease has taken him more deeply into the plant realms, using them as allies to create health in mind and body. He also apprenticed to Miahuatzin to learn the ways of a curandero, awakening his heart-path. 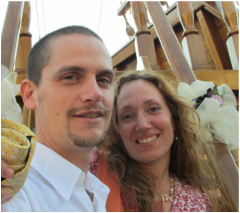 Together they ran a private practice of healing for 7 years in Cornwall, England and have continued to offer healing treatments since they moved to America in 2012. Treating families, couples, children and individuals struggling with many health and emotional issues. They have taught many seminars on this fascinating Medicine system, and also offer community Temazcals (Sweatlodge Ceremonies). They are connecting the indigenous traditions of the Americas to indigenous European/Celtic traditions that have been obscured through time and conflict. They can also support in healing Lyme Disease though herbal protocols designed specifically for each individual. Herbal Consultations - Designed to support your body's natural healing process, we create personal formulas together. $50.00/hr. We generally work with a couple of treatments for each session. Please contact me with what treatment interests you and also what issues feel most important to address, then we can work out what is the best method of treatment. A session can last up to two hours, including time for platica (talking) and grounding afterwards. Depending on your situation, we may recommend three treatments in a row, or a session with a follow-up after 20 days. The practice is highly flexible and applicable to most types of imbalance, as there is usually a way of working, whatever the severity of the illness.